On the one-year anniversary of In the In-Between, we sit down with founder Gregory Jones to ask him about the first year and the state of the digital arts. 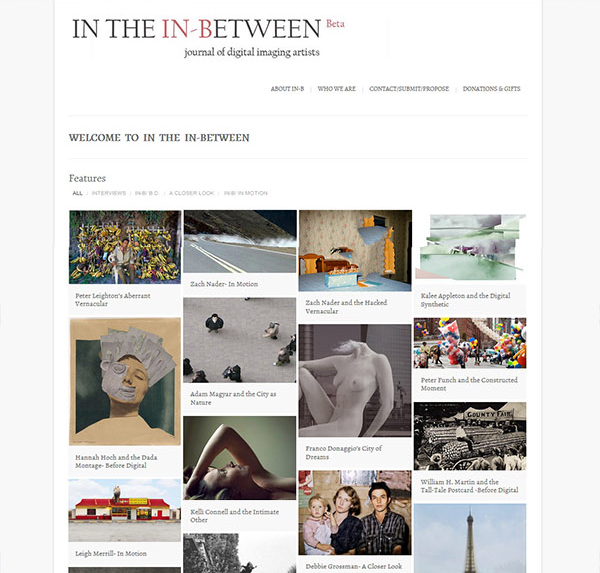 fototazo: In the In-Between is a "journal of digital imaging artists." 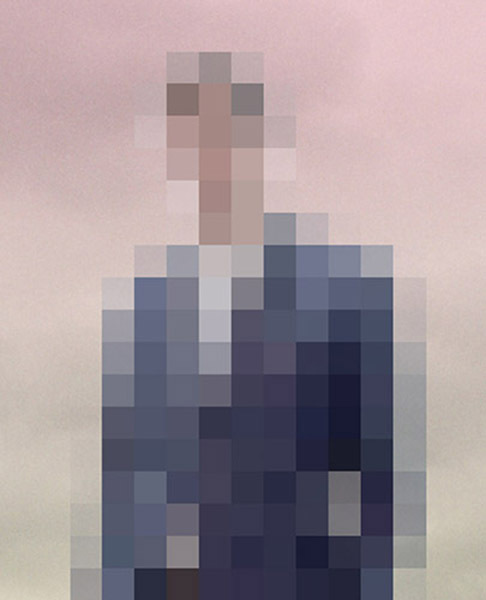 What exactly qualifies someone as a digital imaging artist? Where do you draw the line in terms of enough intervention in an image to consider it a "digital image" or a work of "digital art"? Gregory Jones: "Digital Imaging Artist" is a very fluid term, and not one that can be applied specifically to photographers, but to animators, illustrators, video artists... I think in this context we're talking about the creation of images that wouldn't otherwise be possible outside of the digital medium. I like to think that my own editorial decisions are shaping the definition, rather than the other way around. Photographically, digital imaging is unique in that it's intervening in visual information that's already there. It is fascinating to me, the process of taking referential information and fictionalizing it. I like to think about how processes and theories in art reflect the way we think and interact with the world. In this case, using the referential as a base of objectivity and using digital processes as a means of a perceptual filter. It's a great construct that mirrors the way we disseminate information about our world. f: What inspired you to create the site? What are its mission and goals? Where does the site name come from? GJ: In the In-Between has several roots. The largest one for me was a particular frustration in not being able to find a suitable online outlet for my own work, which investigates street photography through the use of composite imagery. I wanted to make a web space where I knew my pictures could belong, and I encourage every photographer in the world to do this. Digital tools have created an immeasurable paradigm-shift in the production of pictures. There's a significant percentage of the picture-making population that incorporates these tools into their process, and its important and valuable to have a media outlet that can spotlight this area of creation. What's more to consider, is that the digital revolution is still in its infancy. Digital imaging will only become more prominent over the coming decades. So if you ask me what the main goals of In the In-Between are, I would tell you that it seeks to spotlight a relatively new and rapidly expanding area of photographic production, theory, and aesthetic. 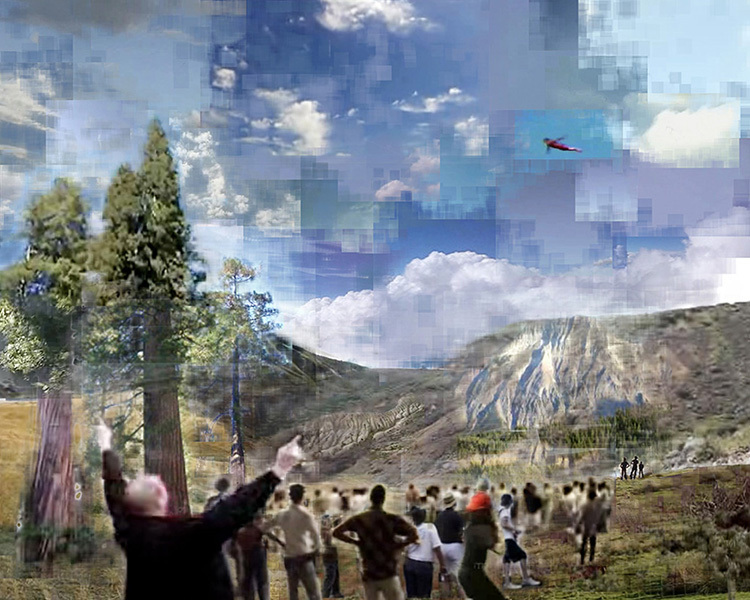 The name In the In-Between refers to the conceptual space in which these types of pictures exist, not quite truthful, yet not entirely fictional either. They're somewhere in the in-between, a type of ambiguous void that appears when we approach paradoxical ideas. © Josh Poehlein, The Flying Man, from the series "Modern History"
f: Has running the site changed how you see the digital imaging arts? GJ: Of course! I'm now in a unique position in that I have an enormous list of artists I'm watching who are working with a particular set of tools. Since I began the site, I'm constantly surprised at how these artists have utilized these tools to create such a variety of personalized and realized visions. And that's the thing that interests me in this process, because it opens photographs up to a greater realm of imagination. At any given moment there are a finite amount of things to photograph in the world. Digital technologies allow greater control over images, and they allow the expression of limitless imagination. We're seeing photo-artists realizing their individual visions more than ever before through the use a more complex process of decision-making. f: What are the changes, advances, and issues that seem more particular to this branch of photography as opposed to other branches? GJ: I think as time goes by digital processes will only become more prominent in the photographic landscape. The technology is advancing at such an incredible rate it's hard to imagine what types of pictures we'll see in another ten years. A big topic of conversation happening now is about the sheer amount of images that exist in the world, and what we're supposed to do with them all. Looking at the website now, I count eight artists we've featured who use existing imagery as a starting point to create something new. The answer to this question of what we do with all these pictures, it seems, is to recycle them! I'm not sure how to accurately identify other branches of photography. All the old genres are being fractured and put back together in new ways, conceptually and in process. The progression of ideas being played out in photography now is incalculable; genres breed sub-genres, which themselves splinter off into cacophonies of competing and complementary picture-ideas. When an artist reaches his or her highest level of development, I think they can be considered a branch unto themselves. f: Have you been surprised by anything about the online photography community through taking a more active role in it? GJ: I knew very little about the online community when I started out, and I was quite surprised by the amount of dialogue and support that was occurring. I'm still discovering more every day. The only problem with it is that there are very few online hubs where various artists and publishers can really come together en masse. The Flak Photo Network does this very well, but I'd love to see more web-based meeting places spring up. Wouldn't it be wonderful to have a facebook-like social networking site for the photography world? f: How has working on the site impacted your own photography? GJ: I started this site one year ago, and I haven't made a photograph since. (well, I've made a few) I'm actually going to New York for a couple weeks in July to start a new body of work, so I'm curious to see if the various ideas from the artists I've featured will bubble to the surface. f: What are sister sites that also work with digital imaging artists that you would recommend? GJ: One of our media partners, Phrame: Photographer's Creative Network, is starting to come off the ground now. They have already held two great exhibits, Splash #1 and Splash #2, and will soon be starting more initiatives to build awareness of web and digital-based practices. Fred Ritkin's project, Pixel Press, is also a good resource for applications of digital media in documentary work. Considering the increasing role that digital media is playing now in the photographic world, I expect many more blogs and organizations like these to spring up in the coming years, and I'm looking forward to working with them! © Johan Rosenmunthe, untitled, from the series "Off"
f: You've worked with a number of people on In-B. How have you balanced personal vision with collaboration? GJ: First and foremost, this website wouldn't be possible without the offerings and input of my contributing editor Meghan Maloney and the support of Steve Bisson, editor of Urbanautica, who I used to write for. I have endless gratitude for both of them! With my personal work, I'm very stubborn and protective about my ideas; it's how I've always been wired. In creating In the In-Between however, I've been learning the value of collaboration, and it's been critical to the site's success so far. I've learned a lot from my friend and guru Lance Speer, who is a former editor and head of marketing for 21st Century Editions. I'm also currently working with Excerpt Magazine editor Amy Majoram to come up with some very exciting editorial ideas. Of course, interviews are collaborations in themselves, and so I owe much to all the artists who've been a part of In-B so far. I'd like to extend a special thank you to Nadine Boughton, who took the plunge as the first featured artist when I had no audience to share with. June 25 will mark the one-year anniversary of her interview and the beginning of In the In-Between. © Kelli Connell, Wide Awake, from the series "Double Life"
f: Where is the site going? What are your plans for year two? GJ: I've got a dozen ideas for In the In-Between that I hope to start rolling out over the next year. I'm beginning my graduate work at Visual Studies Workshop in the fall, so I'm going to be looking for more writers to take over on the content-side of things. More collaboration with fellow publishers and artists is a must. I'd also like to start publishing more essays on trends in digital imaging, as well as more moving-media pieces. I'm going to be putting out a call for such work to graduate programs across the country in September. Of course, the website is still in its beta phase, and I'm constantly tinkering and changing the design. We're currently working on getting In-B better optimized for mobile devices. The trouble is that I'm not a web-designer by any means, so this has been a very time-consuming-- albeit enjoyable-- process. If there are any developers who'd like to donate their time and expertise in exchange for publicity, they know where to find me! Also, I'm thinking how In-B can be translated into print form some time down the road, via magazine series or in a book. Finally, We've started an initiative to make In the In-Between financially sustainable. We're asking for $10 donations, which cover a month of hosting costs. 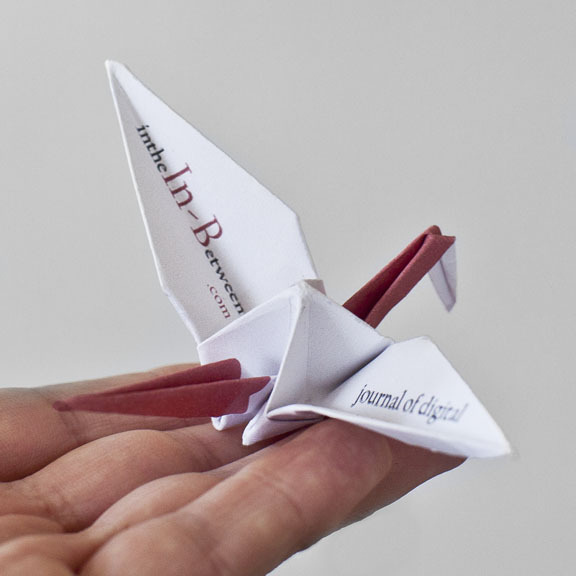 All our supporters get their name and web-link published permanently on our site, plus a hand-made, collectible origami peace-crane, and a link shared to our growing number of twitter followers. With just twelve donations, we're funded for an entire year, so every contribution carries a lot of weight!